In honor … John, Kevin, Harry, Rob L., Joe, Fred, Al, Mark, Rob C., Deac, Richard, and everyone we’ve served with and who have served …. And because all of those mentioned above have been there, some more recently than others …. If you’d like to help, visit the National Coalition for Homeless Veterans. 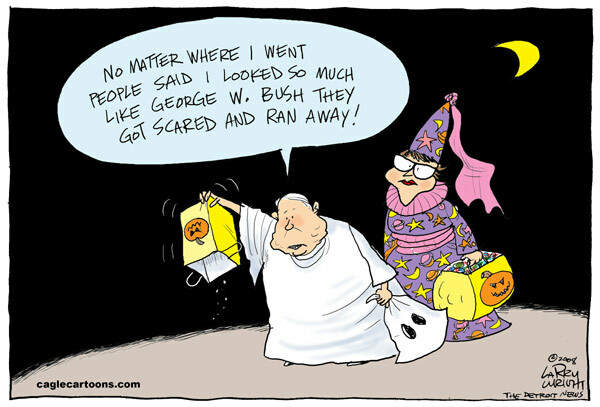 Some cartoons for you this Saturday as we prep for the election. I’m having trouble realizing that the election is just a few days away since we’ve been at this so long. Anyone else have that problem? I hope that everyone out there has a great voting experience. Remember to video your vote and take the voter hotline numbers (1-866-MY VOTE or 1-866-OUR VOTE) with you. This reminds me of JJP’s penchant for calling McCain “Senator Country Last,”among other things. Maybe it’s the obsession with all things Star Wars in my house. Or maybe I’m just really, really … REALLY … ready for change. This is getting completely out of hand. Powell has been one of the right’s most respected Generals and the standard bearer for their campaign of “look how color blind we’ve become.” What we’re starting to hear is, “Boy, we made you. How dare you turn on us now.” It’s disgusting and disrespectful and makes them all look like a bunch of idiots. Descending into portraying him as Benedict Arnold in blackface is beyond lunacy. I’ve stayed away from this … on purpose. But a cartoon caught my eye this morning that just completely sums up the entire subject.